New Jersey Department of Transportation officials today announced the launch of a special Twitter account — @511NJ_Papal — to keep motorists informed of traffic conditions during the Papal Visit to Philadelphia this weekend, Sept. 26 and 27. The @511NJ_Papal feed will Tweet real time traffic conditions on all state roads in Mercer, Burlington, Camden, Gloucester, Atlantic and Salem counties to help followers make informed decisions and avoid congestion as best as possible during the Papal visit. It is similar to the 511nj Twitter accounts launched in August, which feature 24/7 real time traffic information for 18 specific state highways. In addition, subscribers to @511NJ_Papal will get real time information about the Delaware Memorial Bridge, Commodore Barry Bridge, Walt Whitman Bridge, Ben Franklin Bridge, Tacony Palmyra Bridge and the Betsy Ross Bridge. To subscribe to the account go to twitter.com/511NJ_Papal. This Twitter account is one-way automated information feeds from New Jersey’s 511 service and are not consistently monitored by NJDOT. It is provided as a convenience and is not intended for receiving feedback, comments, or event reports. Motorists can visit the 511NJ Papal Visit page to view a map with real time traffic information, travel times in and around the Philadelphia Region as well as links to other transportation agencies supporting the Pope’s visit. 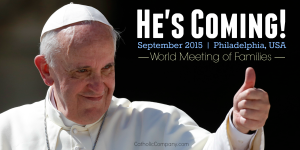 The 511NJ Papal Twitter Feed will be active now through Sept. 30. If you plan to attend any of the festivities in New York or Philadelphia this week, mass transit will be your best option. For information about NJ TRANSIT Service for the Papal Visit to New York or Philadelphia go to www.NJTRANSIT.com/papal. NJ TRANSIT is the best option to get into Philadelphia to attend the events — either on the Atlantic City Rail Line direct to Philadelphia’s 30th Street Station or The River LINE to the Walter Rand Transportation Center where you can transfer to PATCO or walk across the Ben Franklin Bridge. If you plan to take NJ TRANSIT you’ll need to buy your tickets in advance, so don’t delay. On Saturday, Sept. 26, and Sunday, Sept. 27, mass transit will be the best option to get into Philadelphia, and you must buy your tickets in advance. NJ TRANSIT’s Atlantic City Line and Amtrak’s Northeast Corridor service go directly to Philadelphia’s 30th Street Station. You may also take NJ TRANSIT’s River LINE from Trenton to Camden and transfer to PATCO. Special tickets are available for people planning to ride the Atlantic City Rail Line and River LINE as the lines will operate on a limited schedule only on both days. Customers need to purchase their tickets in advance of this weekend. You can buy tickets online at www.njtransit.com, at any River LINE station for River LINE tickets, or at Atlantic City Rail and Bus terminals for Atlantic City Rail Line tickets. If you plan to drive, expect heavy congestion and delays. Camden County has made 8,500 parking spaces available for Sept. 26 and 27 at the Camden Waterfront. These spaces need to be preregistered in order to secure a space. For more information and links to other transportation and Papal Visit web sites, go to www.PopeNJ.com.